Last month my husband and I had the privilege of going on a Christmas Walk in our small town. 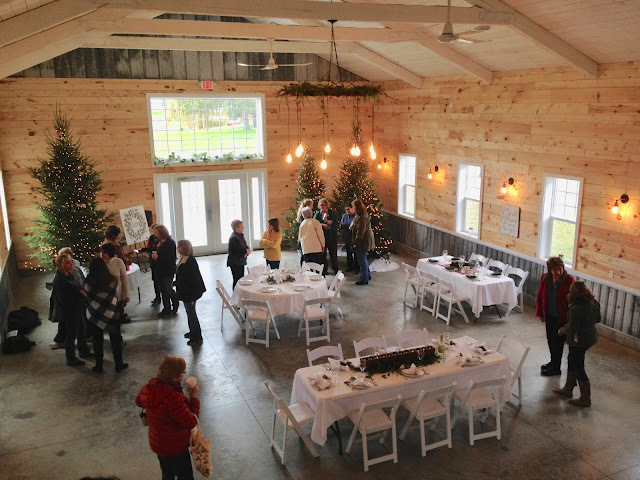 One of the "Homes" on the Christmas Walk was a renovated barn. It was so beautiful and well done, I really wanted to share it with my readers. 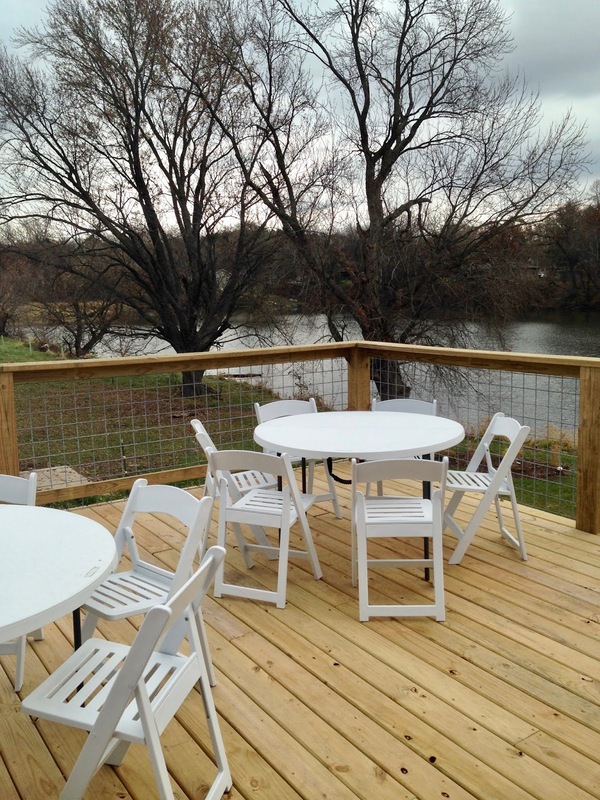 The barn is located right next to a local park and has beautiful views of a small lake. 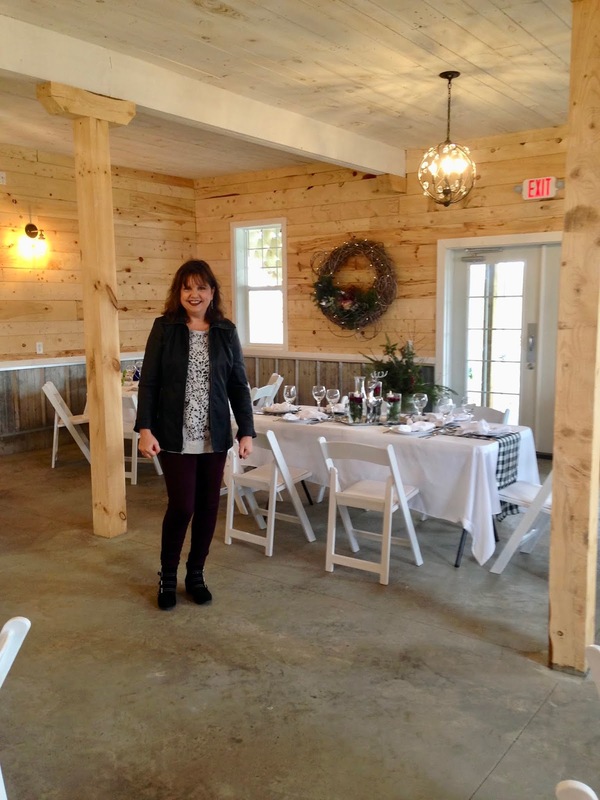 It is rented out for weddings and other gatherings. My first thoughts when entering the barn was how light and bright it was. 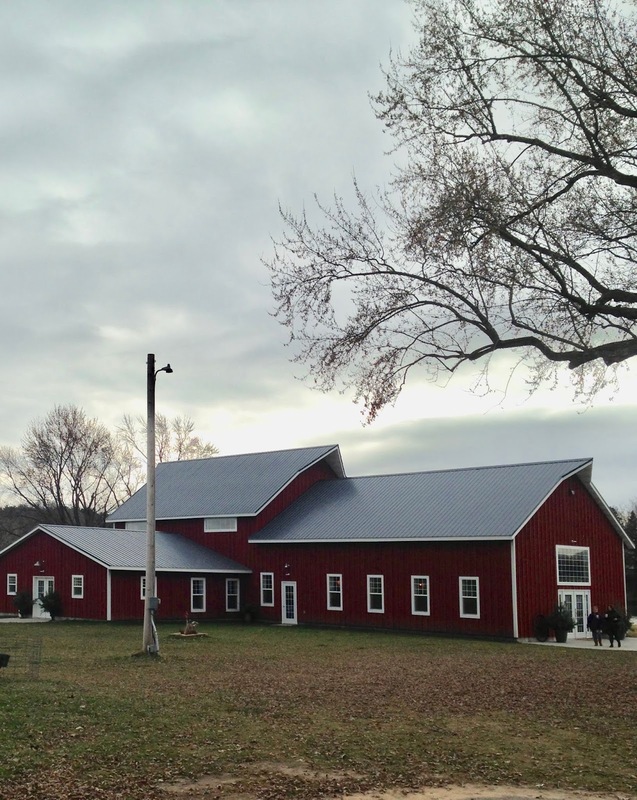 Most barns tend to be on the dark side, but because of the white ceilings, the un-stained wood siding, and all the added windows, it was not a typical dark barn. 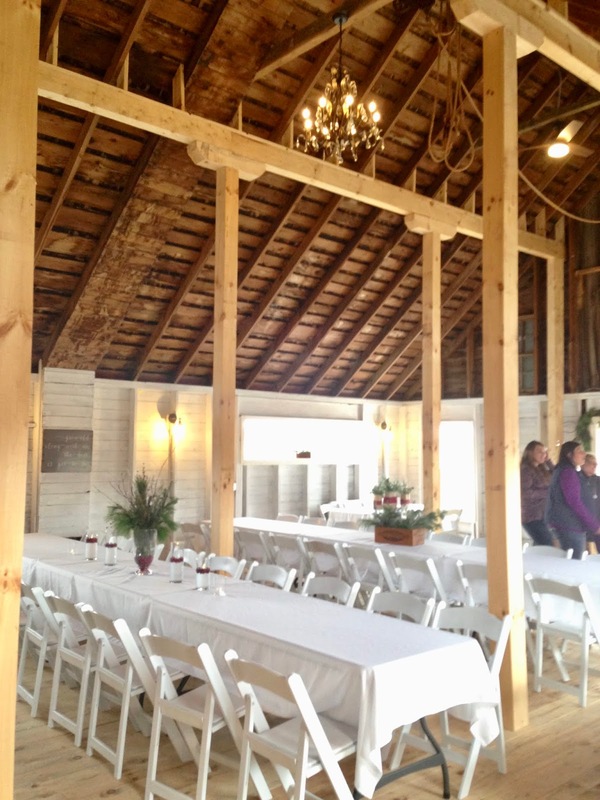 Elegance and rustic beautifully blend together in this barn. Galvanized steel on the wall, and a wagon wheel light fixture are gentle reminders of the original use of this beautiful barn. 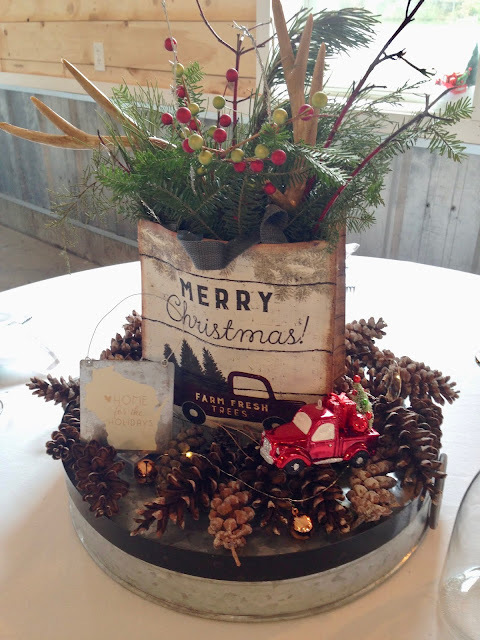 All the tables were decorated for Christmas. 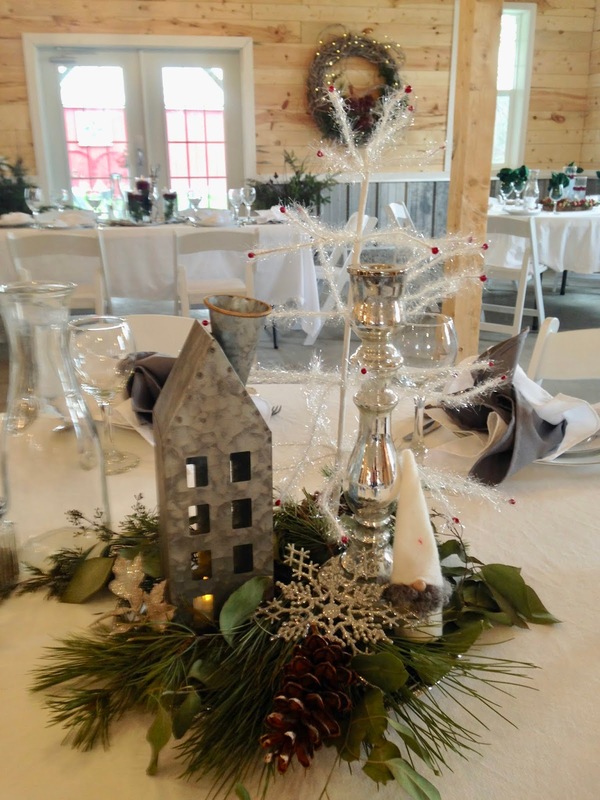 Each table setting is different. I took pictures of a few of my favorites to share with you. 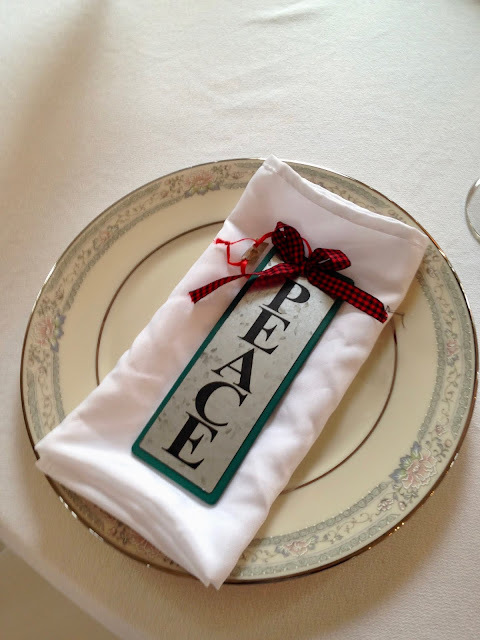 Hopefully they'll give you some last minute table setting ideas for your own Christmas table. I loved so many of the table settings, it was hard for me to choose a favorite, but this one is certainly on the top of my list. 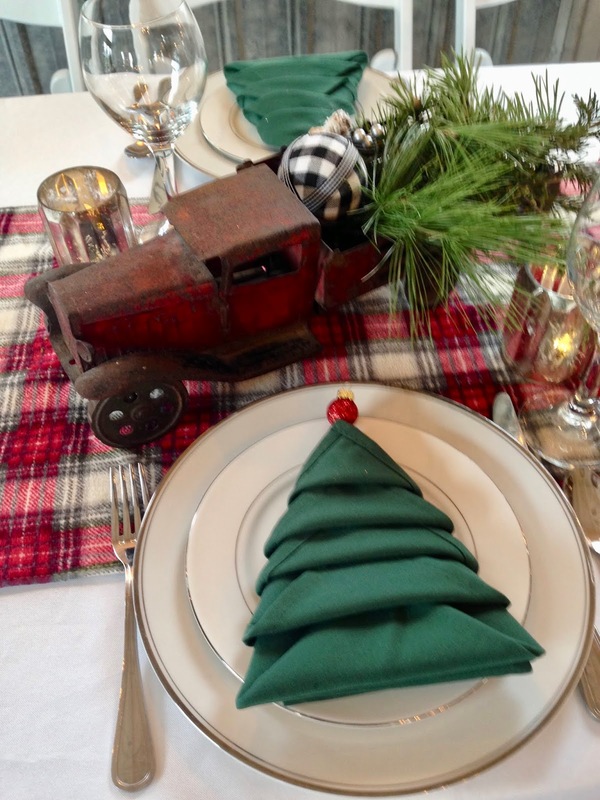 I love the folded tree napkin, isn't that amazing? And the vintage truck is perfect for this location, not to mention how much they are trending right now in interior design. 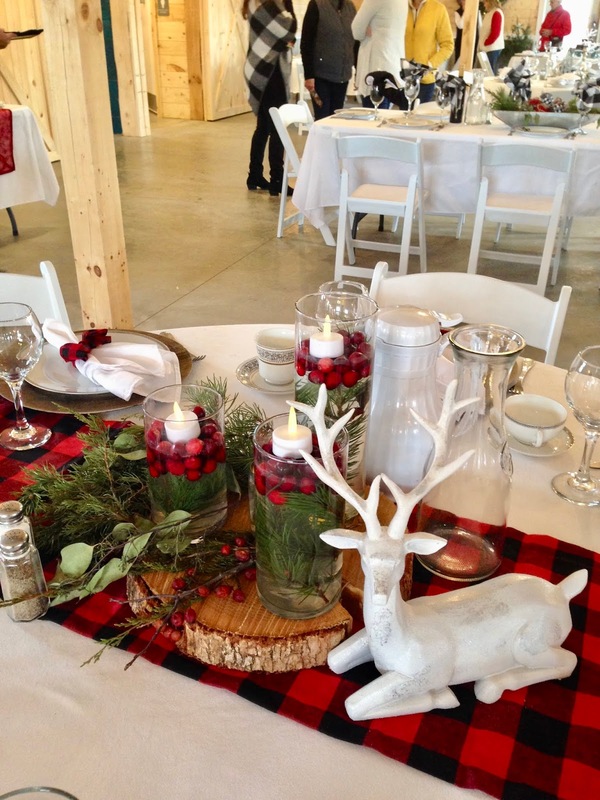 The flannel table runner completes the entire ensemble. The deer statue and red/black plaid flannel of this table setting is also perfect for this country barn setting. I love the candles on top of the cranberries and pine boughs too. What a cute, simple, easy idea to tie the napkins with a pretty plaid bow that matches the runner too! Silver and white is always one of my favorite Christmas color combos because I love the elegance. 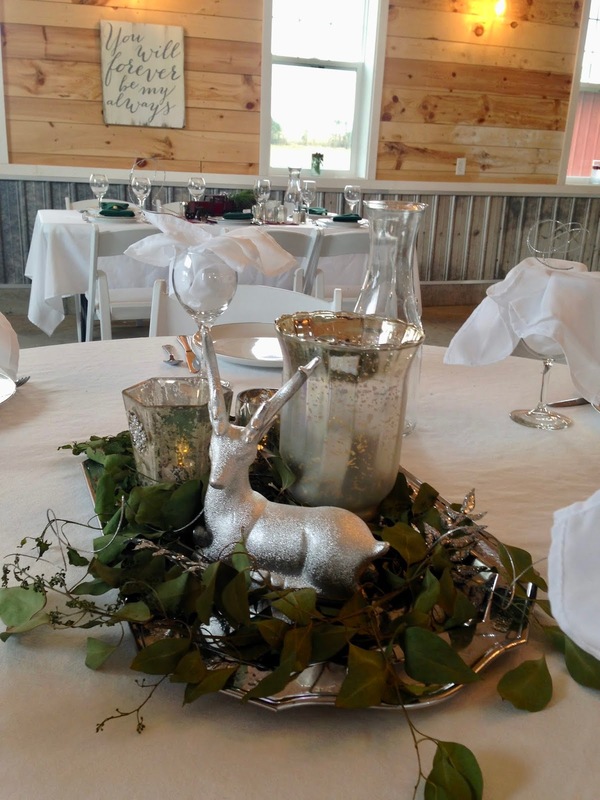 The addition of this galvanized steel house next to a shiny silver candle stand is a perfect blend of rustic and glam for this country barn. How cute is this one? Love the vintage truck ornament placed amongst the pine cones. 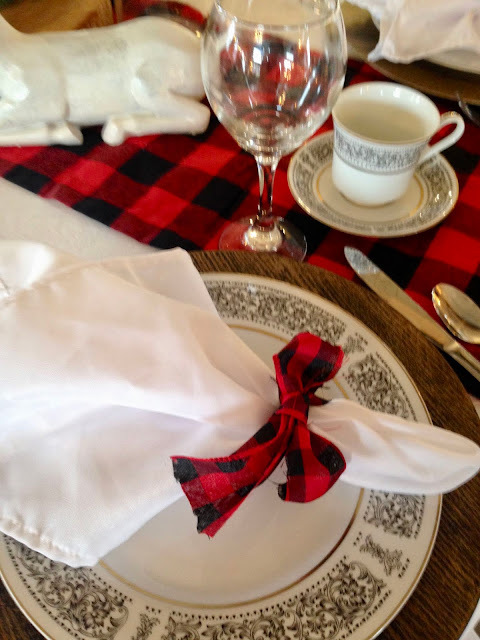 I can't do complicated napkin folding, so I'm always looking for easy, yet charming napkin ideas. I love this one, because it's so simple, yet so pretty and appropriate. The ornament would make a nice parting gift for the guest too! 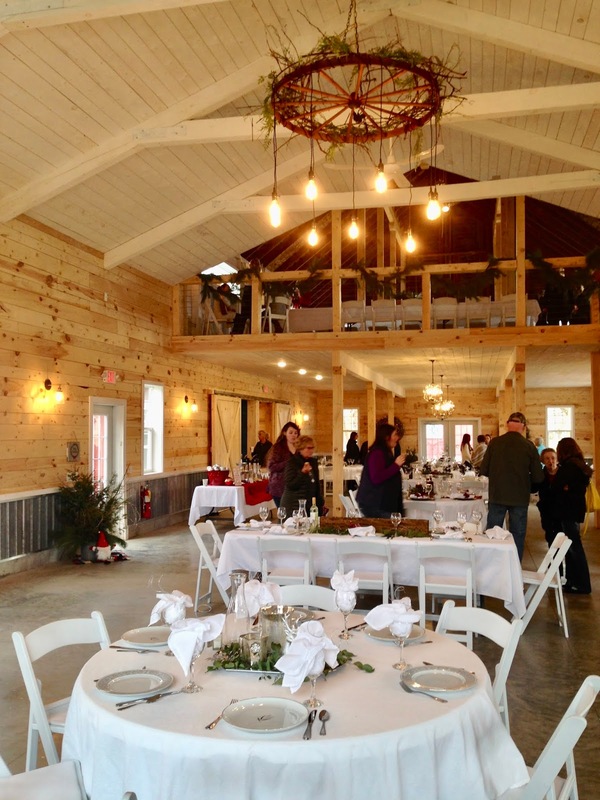 I love how they added a more glamorous, antique chandelier in this part of the barn. These displays were located by the back door. I always love it when vintage sleighs are decorated for Christmas, don't you? 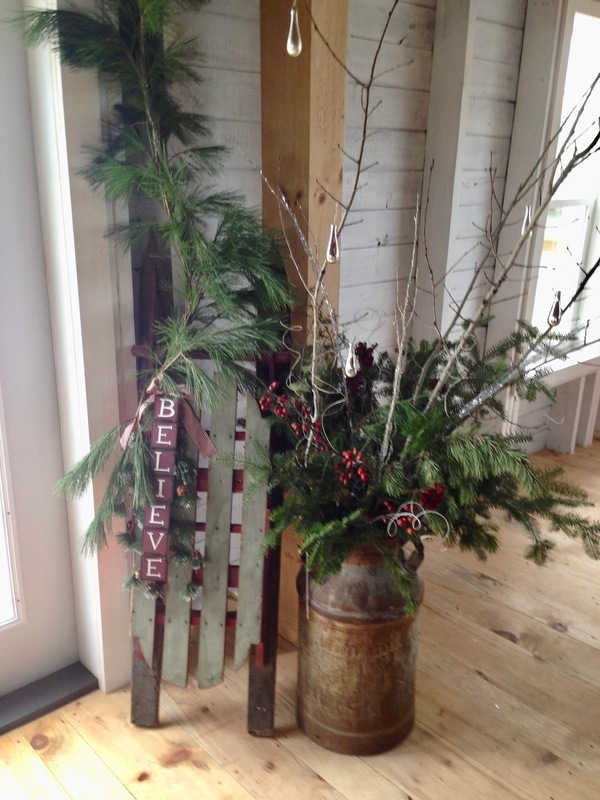 The milk can is the perfect vase for a floral arrangement in a barn! This is the staircase leading to the balcony. 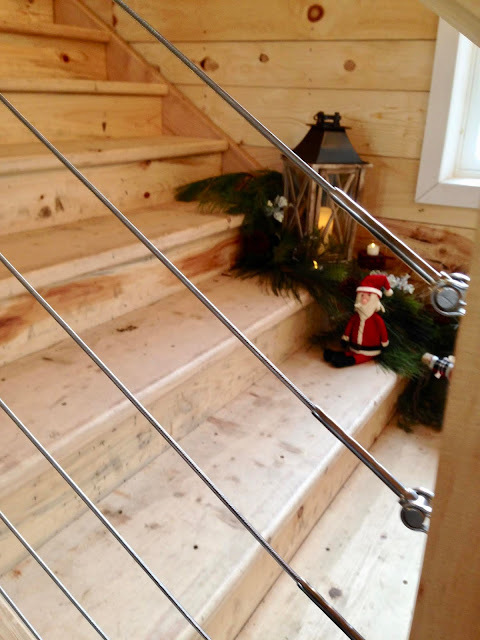 Isn't the "railing" interesting? 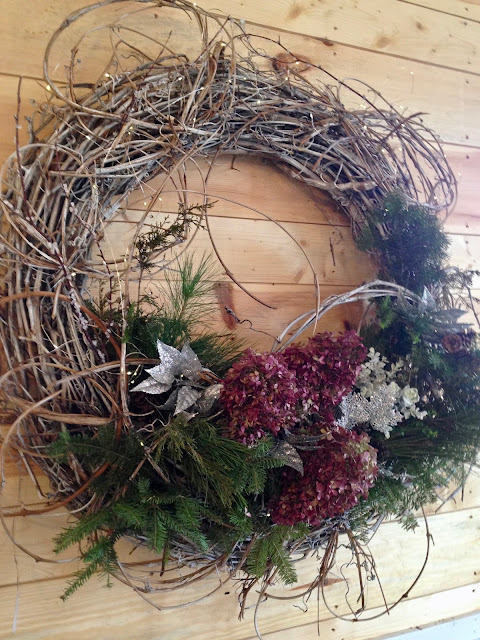 This beautiful grapevine wreath hung on the back wall. I love the little lights woven through the wreath. I'm sure these lights have been around awhile, but this is the first year I've noticed them popping up in Christmas decor everywhere. I have no idea how long they last, or how much they cost, but they are a great idea for lighting something where you can't add a cord and connect to a outlet. I noticed a lot of the table settings had these little lights. I will have to look for them next year. They are so cute! 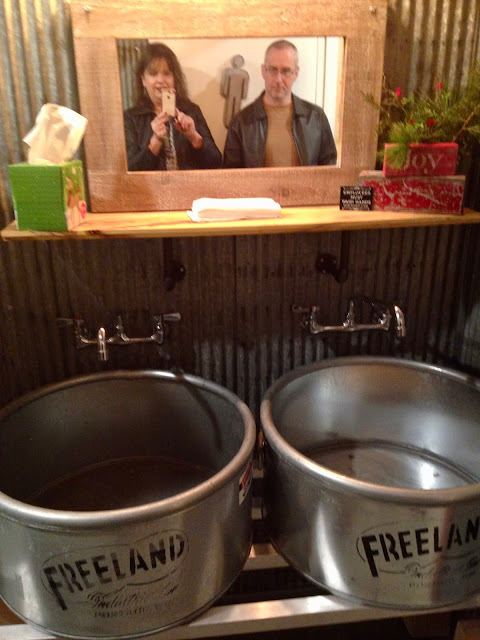 Whenever I go to a nice restaurant I love to check out the bathrooms, and this barn was no exception. I couldn't wait to check out the bathrooms, and they did not disappoint! I was blown away by their creativity! 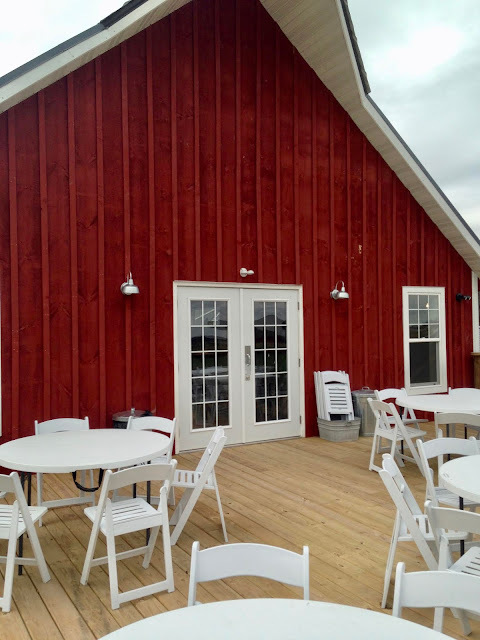 They used a lot of barn elements in their design. This is one of the "sinks" in one of the bathrooms. And here is the sink in other bathroom. Isn't it fun? It's rustic, yet, so glamorous at the same time. I love those mirrors too! 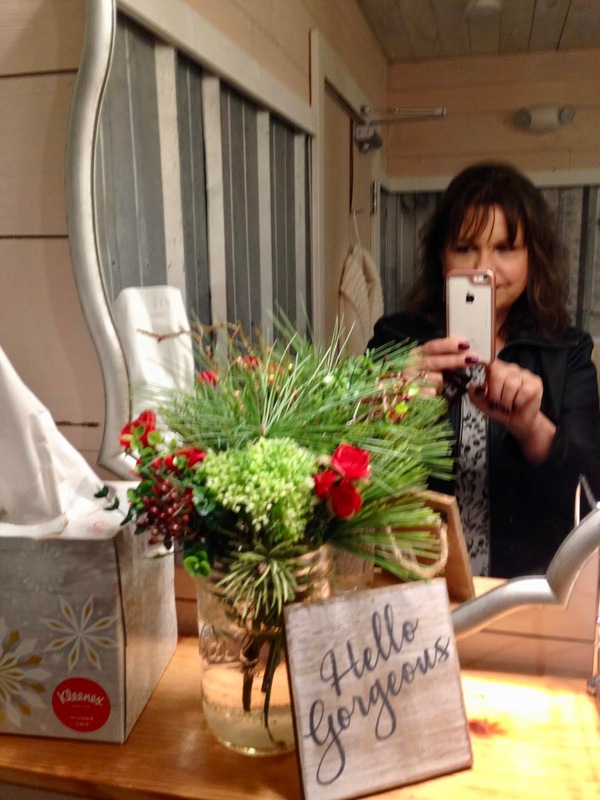 The "Hello Gorgeous" sign in front of the mirror was the perfect added touch! We all need to hear that message! This is one of the doors to a bathroom stall inside the bathroom. Outside the balcony door is another eating area overlooking the park lake. View of the lower level of the barn as seen from the balcony. The floor was stained concrete. It was stained a marbled, light grey; perfect for heavy foot traffic, and the color keeps the room light and airy. 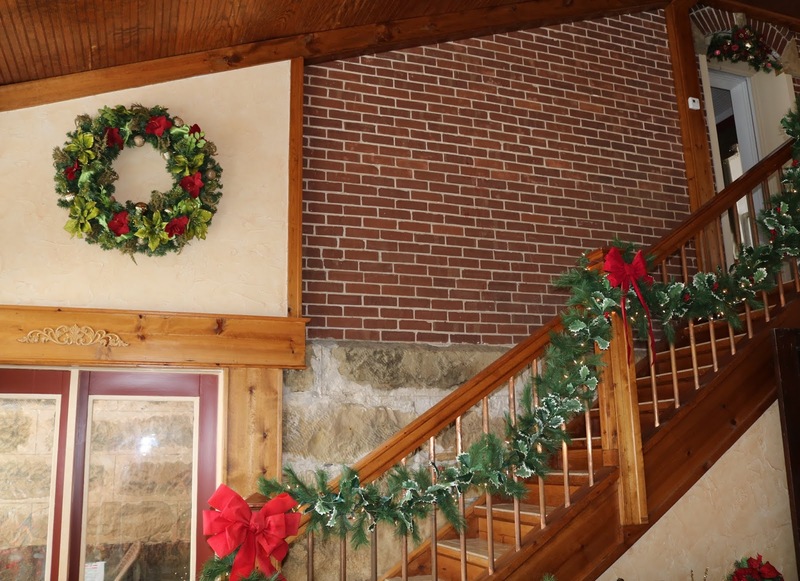 I hope you enjoyed my Christmas Walk through this beautiful barn decorated for Christmas. 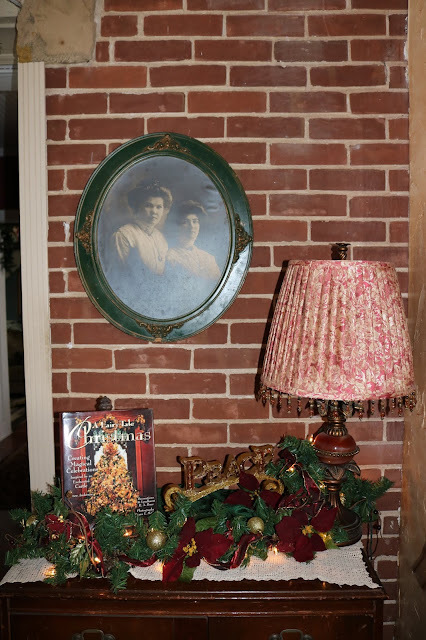 I hope it gave you some ideas to use in your home for the holidays, I sure got a lot of great ideas! 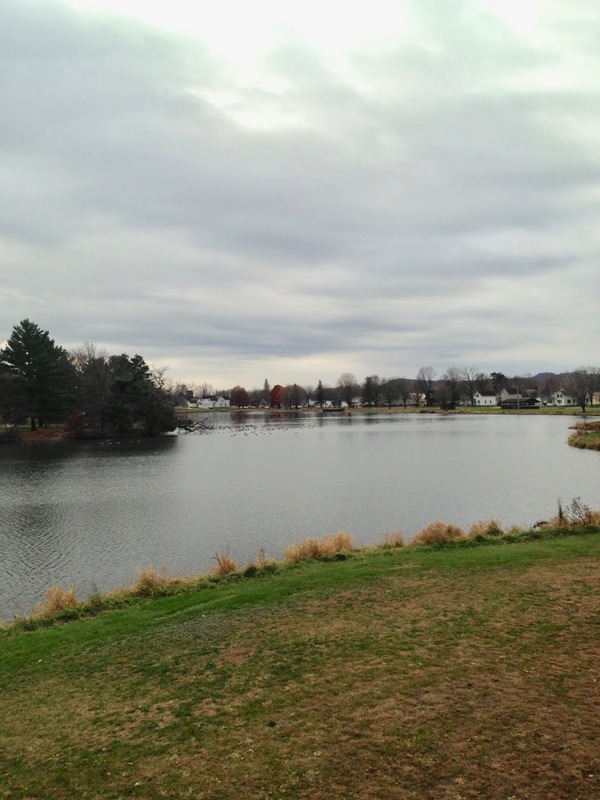 If you're interested in learning more about "The Barn at Mirror Lake" see their website HERE! 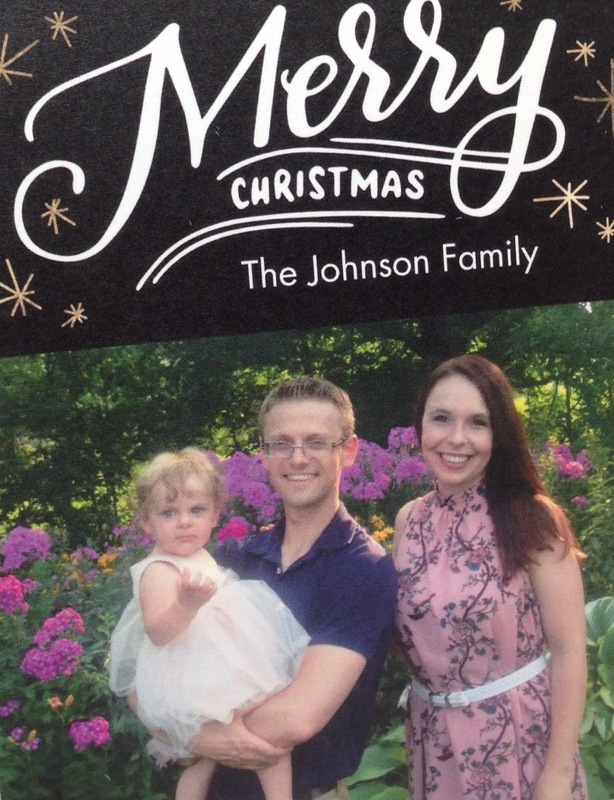 I just mailed out our 2018 Christmas Cards so I'm free to share it here on my blog. Every year I wonder if I should still mail out Christmas cards as I get fewer and fewer in return. With everyone using social media now to send Christmas greetings, sending out an actual card isn't the popular thing to do. It also can be very expensive and time consuming. But, the traditionalist in me still continues to send out cards the old fashioned way. Somehow it doesn't feel like Christmas without the annual Johnson Christmas card. Plus, I have issues with the social media greetings. 1. They are very impersonal, as you can not include a individual note to each person. 2. You can not guarantee that every friend and family member will even see your Christmas greeting on social media, unless you send out mass PM's, which people don't like. 3. Not everyone is on social media. I have a lot of relatives and friends who do not use social media. So because of these reasons, I will continue to send out Christmas cards via snail mail. This year I did something different from previous years. 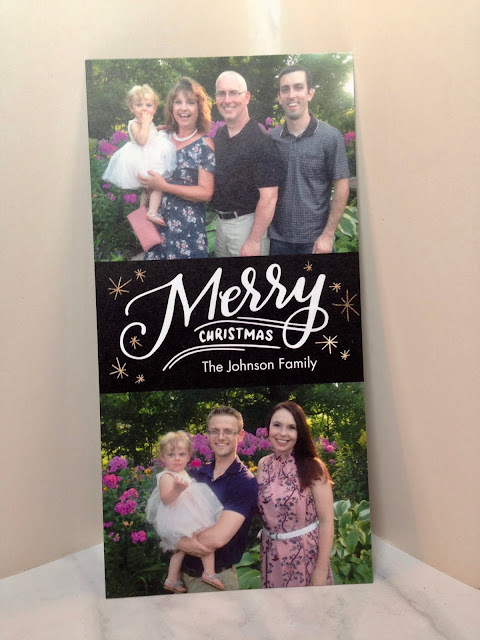 Normally, I make a handmade card, type out and print a Christmas Letter, and put a photo inside the card. You can see last year's example HERE. 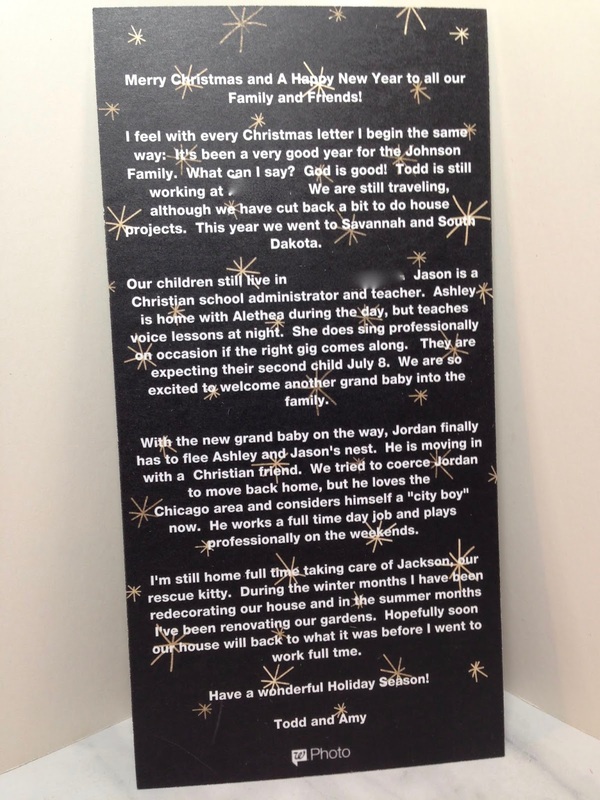 This year I printed my card on a heavy card stock and printed a Christmas letter on the back. It saved me lots of time and printer ink, plus the cost of mailing them was cheaper as I didn't have to pay for extra postage! The pictures I chose to use were from a summer wedding we attended. I liked that we were all color coordinated (that wasn't even planned!) and that the background was the same in the top and bottom photos. Having the same background in the top and bottom photo tied the entire card together. I had my choice between a black or red background in the middle. I went with black because the guys were wearing dark colors. The back of the card was black with gold "stars". 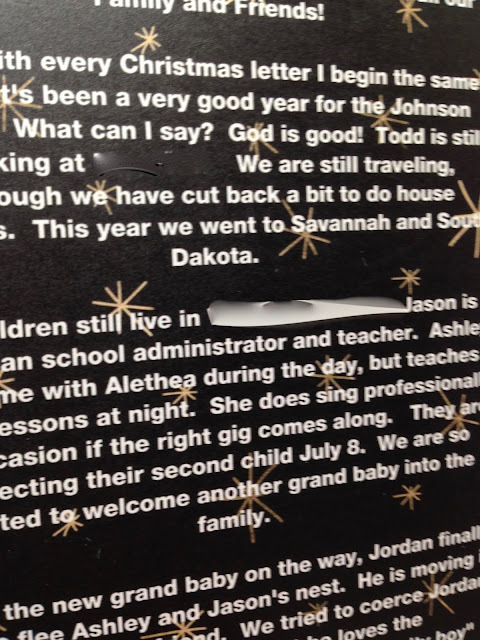 I printed a family letter in white with bold print so it could be easily read even with the print in the background. I blurred some words out of the letter in this post for security reasons. The hardest part about writing a letter to fit on the back of the card was keeping it small enough to fit! There was so much more I wanted to say. I would have loved to have said more about Alethea. Maybe next year I'll skip the job info as that never seems to change year after year, then I can include more personal stuff. `Even though my letter was shorter than I wanted it to be, this worked out so well for me I think I will keep doing it in the years to come. I'm grateful that Walgreens came out with this Christmas Card option. So what about you? Do you still send out Christmas Cards the old fashioned way, or do you send your Christmas Greetings via social media or email? I'd love to hear from you! 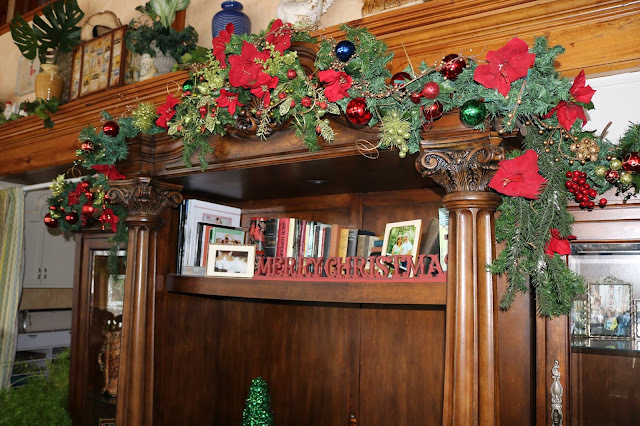 I was so excited this year that Thanksgiving was early, because I do not decorate my home until after Thanksgiving and I had a full week to get it done before December 1st. Then, I burned my leg which really slowed down my physical capabilities, and we had to take a few days off to attend a funeral in another city. So, I didn't quite get the house decorated as quickly as I had hoped, but I did get it done. This year, I put up not one, but TWO Christmas trees! One reason was Alethea of course. This will be the first year my grand baby is old enough to really appreciate Christmas. I wanted the house to be "over the top" for her enjoyment! The second reason is that we are actually in the process of renovating two rooms in our house, which left some "holes" that needed to be filled. What better to fill a hole than a Christmas Tree? 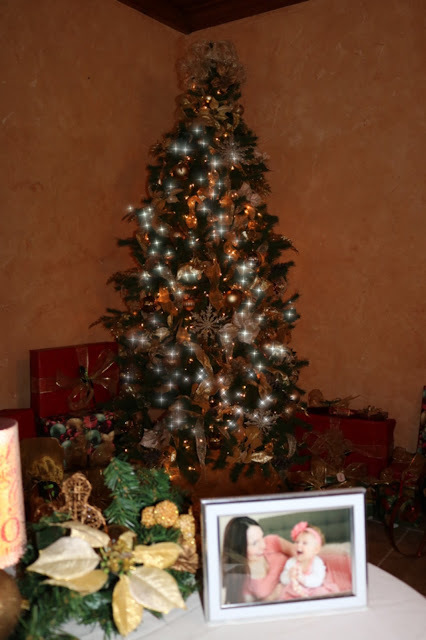 This is the tree I set up in our family room. This large corner was one of the "holes" needing to be filled. When this room is redecorated, this corner will hold a sectional. 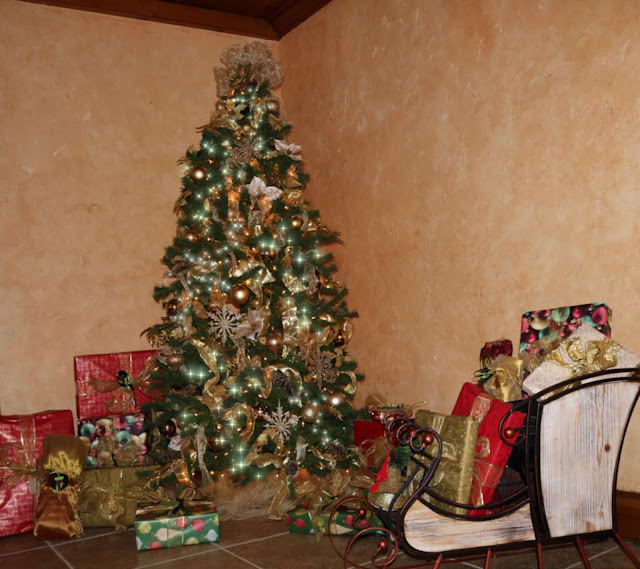 In the meantime, it was a perfect spot for a tree, lots of presents, and a sleigh. We used to have a large, ornate entertainment center in this room. It came in three pieces, we moved two of the pieces to our sun room, but we thought these two pieces looked nice in the corners. 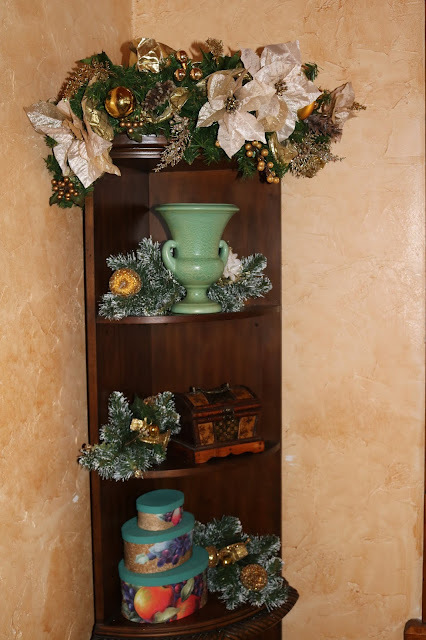 I decorated around what usually sits on the shelves with greenery and white and gold flowers and ornaments. On the opposite wall of the tree is a sectional. It's the first thing you see when you walk into the room. 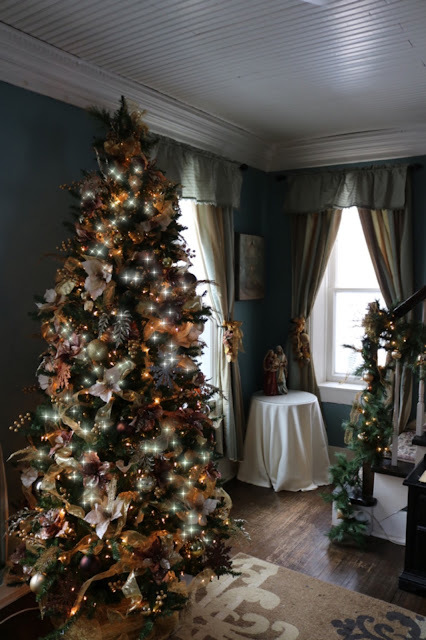 I originally wanted to put the tree between the two windows so you would see the tree first when you walked into the room. But, for safety reasons for Alethea, we had to move our sectional away from the balcony wall and to this side of the room. I was disappointed that the room didn't look "Christmasy" at first glance (you literally have to walk into the room and turn around to see the tree), so I took down a large painting that usually hangs on the wall between the window, and I added a lighted wreath instead. It was the perfect solution! 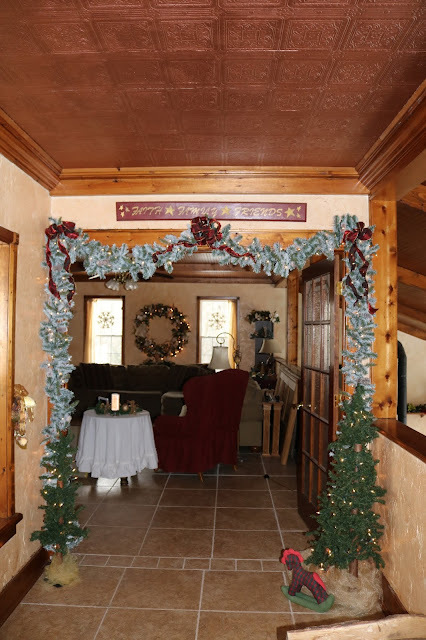 Here is the entry way of our home and also the entry into the family room. 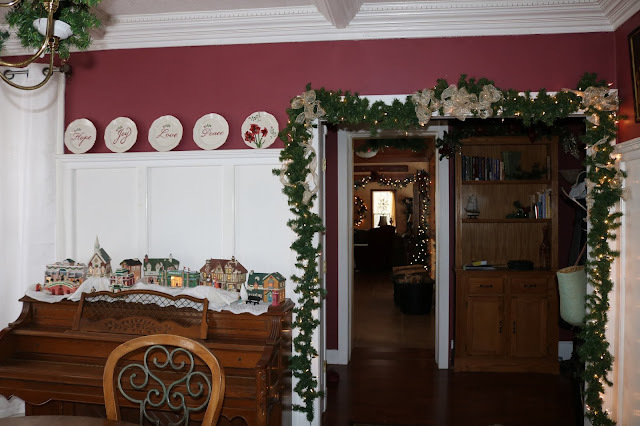 I framed the doorway with garland and tiny trees to add more of a "Christmas feel" to this room since you couldn't see the Christmas tree right away. Sorry for the hodgepodge of furniture and the pile of of boards behind the couch. As I said at the beginning of this post, we are under renovations at the moment. I tried my best to make it look as presentable as I could for the holidays. This is a side table in the entryway. I decorated it with garland, a Christmas book, and a "Peace" sign. This is my second Christmas Tree. This one is brown and gold and is set up in a small living room. This room will be the first to be renovated this winter. There use to be a small couch where the tree is located now. It was moved to the family room to provide extra seating for the holidays. That left a "hole" so I put the tree there. I actually really love the tree here. It is visible from the dining room and it is absolutely breath-taking. It would be nice to put a tree here every year, but I don't know if that's possible. We'll see! Here is a view of the living room tree as seen from the dining room. 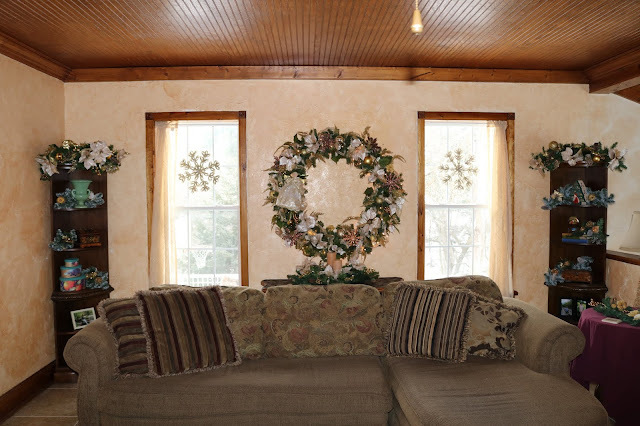 I "framed" the view with garland and an angel over the doorway to the room. I decorated the chandelier with white poinsettias, gold berries, greener, and white birds. It's hard to get a good photo of the chandelier because it's high up, but trust me, it's gorgeous in real life. I also framed the other doorway in the dining room with garland. This view looks into the office and then the entry way, and all the way down to the back wall of the family room. I put out a "Christmas Village" just for Alethea. I've had these houses for years, but it was a long time since I used them; mostly because I always struggle with where to set it up. 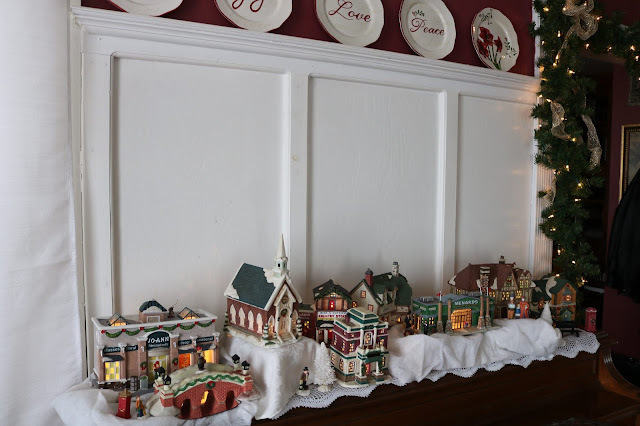 I just don't have a good spot in my house for a Christmas Village. But I really wanted to Alethea to see the village, so I set it up on top of my piano. I added Christmas plates on the plate rail on the wall. I set up a candle display on the buffet top in the dining room. 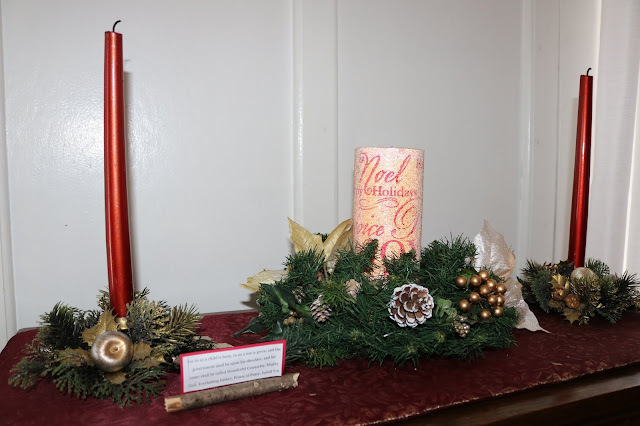 The little stick with words on the left side of the picture is a place holder that I was allowed to take home after going to a ladies Christmas dinner at my church. I thought it was so cute. It has a Christmas scripture on it, and it is held in place with two twigs glued together. So charming, yet so easy to create. The woman who made them so her son helped her make them. What a great Christmas craft to do with your kids. Here is a close up of my Christmas Village. My houses are so old; some are around thirty years old. They make them so much nicer today, where you can see completely through the house and all the interior details. Oh well, mine are "antiques". 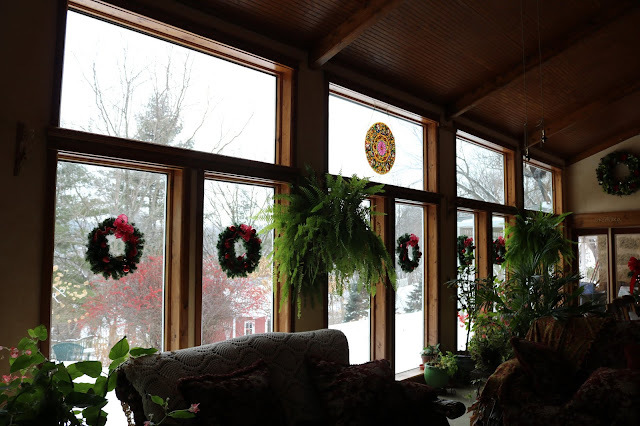 My sun room is always a challenge to decorate for Christmas because it's already filled with greenery from the plants. I put a wreath on every window and a large wreath above the door. I have a lot of "extra" furniture in my sun room that's waiting to go to a good home. I have a lot of people that are interested in it, but no one can ever find the time or the right vehicle to "come and get it!" So the room is getting very cluttered and is starting to drive me crazy. I think pretty soon I just need to put a "Free" notice on Facebook or Craig's List, cause I really need the stuff gone. This is a dresser that I was trying to keep in the family, but no one wants it. I just don't have the space for it. So in the mean time, it sits cluttering up my house. I put Christmas greenery on it and filled it with pictures of my sweet Alethea. 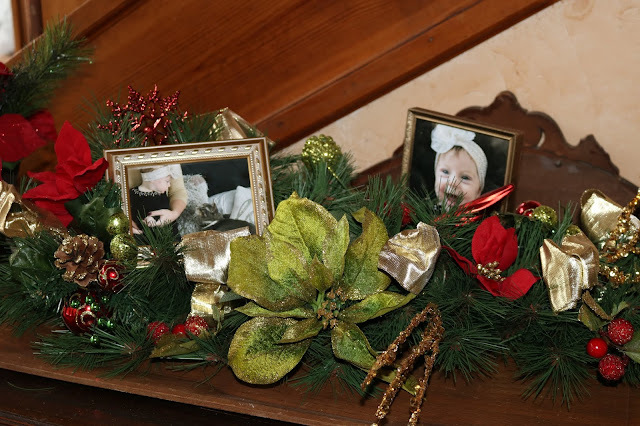 I draped the staircase leading into this room with garland and red bows. This was the entertainment that used to be in our family room. It looks much better down here as it is a big piece of furniture. I'm using it as a book shelf for now, but we may put a tv in here. I adorned it with lots of greenery and red flowers and ornaments. I do decorate EVERY SINGLE ROOM in my house for the holidays, but if I were to show every picture, I would overwhelm you all. I do have videos on my YouTube channel of past years of decorating where I do show every room. I really just add one small Christmas element to every room even if it's just a Christmas knick knack or some Christmas greenery. If you have a lot of gift cards you're giving this Christmas and want to add a handmade touch, I have just the answer for you: Handmade Gift Card Holders! I found the tutorial on the Splitcoaststampers website, but I must admit that although the instructions and video were easy to follow, my finished product never turned out to be the right measurements. I wonder if it was because I didn't have the specific scoring tool she used in the video, or if because I'm just an idiot. :) I did manage to finally get the holder the right size by scoring and cutting it smaller. 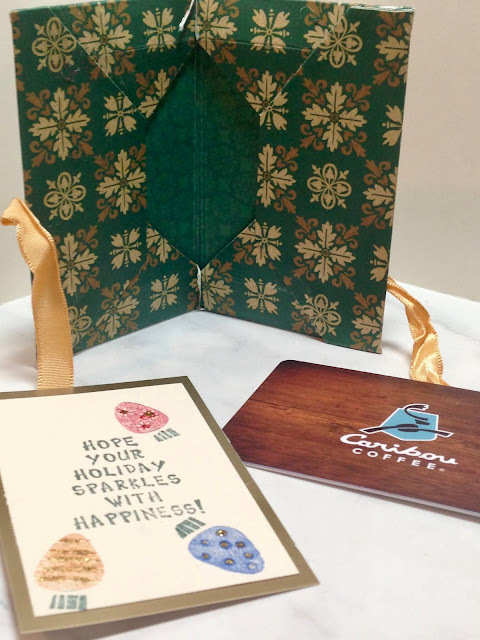 The gift card holder is made with double sided designer paper and is tied shut with a ribbon. There are two slits on the inside: one for a gift card and the other for a little note card. 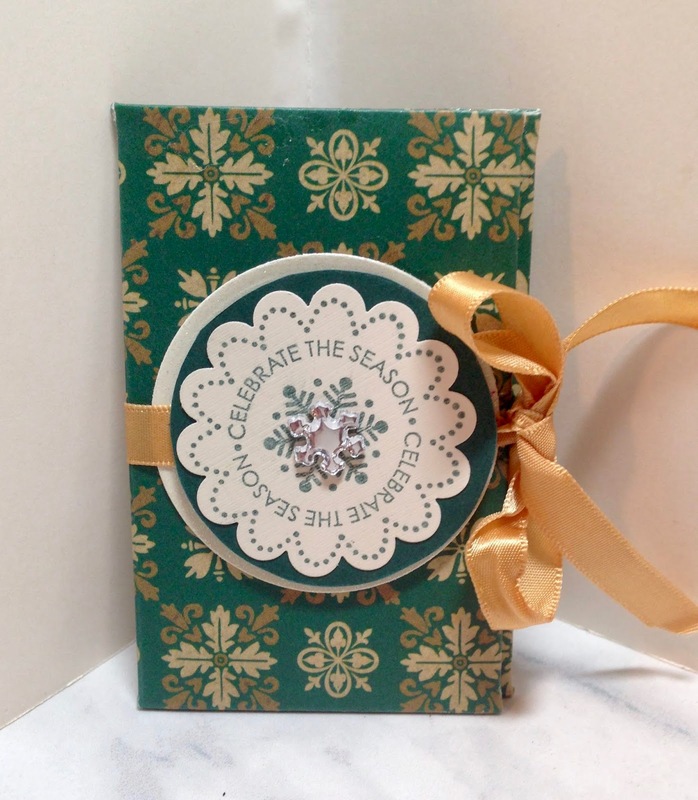 For the outside of the card I stamped a Christmas sentiment then punched it out using a scalloped die. 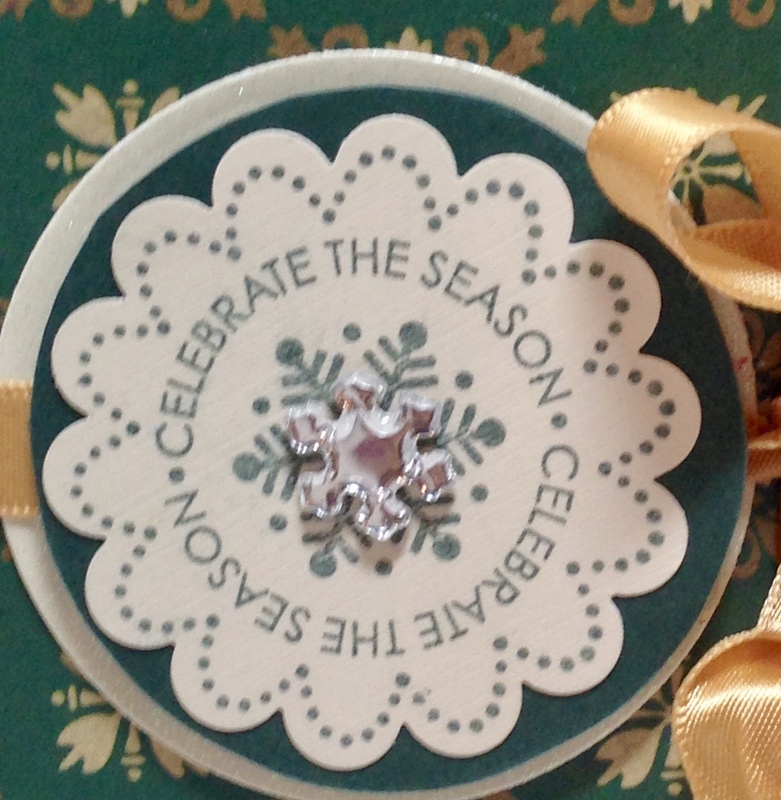 It was then adhered to a round green die cut (the circles were both cut with Spellbinder's Nestabilities Circle dies). The white sparkly circle was adhered to the holder first. Then I added the gold ribbon and popped the green circle and sentiment up on dimensionals just like she shows in the video on the Splitcoaststampers website. To make the note card, I just stamped a Christmas sentiment and stickers on a small piece of yardstick then adhered it to a slightly larger metallic gold card stock piece. I added gold Stickles to the ornaments. Everything fit nice and neat inside. I love the way it turned out, even though I really struggled getting the sizing right. If you give this project a try, I'd love to hear your thoughts. I did leave a note on the Splitcoaststampers website explaining I had trouble with this project. I'll let you know if I hear anything back.